This is the beginning of a brand new segment for my blog. In truth for awhile now I have been trying to come up with a good way to start this feature. Originally I was going to call it “Sunday Indie Sunday” but that never really got off the ground. The idea behind Steampowered Sunday is really simple. Over the years I have built up a large backlog of titles from steam sales and the various humble bundles that I have never actually played or at the very least not really played enough to feel like I have given the game its due. My goal is to grab a “new to me” game each Sunday and give it a decent amount of play time. Afterwards of course I will be writing a blog entry about the game. This isn’t necessarily a review, but more my thoughts and impressions about the game play I just experienced. My friends are already talking about griefing me by adding more games to my list. So we will see how far I can actually make a dent and if I can actually keep up with this feature. 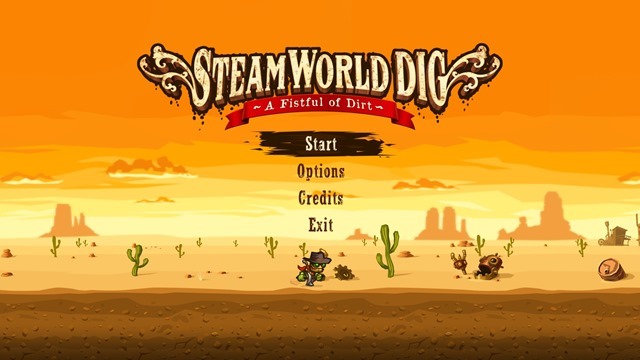 The first title to explore seemed like an obvious pick… since the feature is called Steampowered Sunday, then why not delve into a game called Steamworld Dig. This however is a playthrough that almost didn’t happen. It seems that I found a bug in FRAPs, that no one really expected. It seems as though frap is configured to ignore Steam, and instead of correctly searching for steam.exe in memory, they are just ignoring any process with steam in the title. As a result… SteamWorld Dig seems to be incompatible with fraps. Luckily I remembered that you can also take screenshots through the steam overlay with f12. While this is not exactly what I like to do… as I tend to disable screenshot functionality and have fraps do all the work… that way all of my screenshots end up in the same directory… I made do. 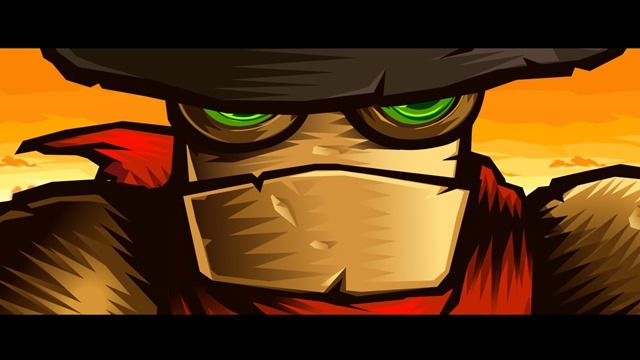 I picked up Steamworld Dig some time ago during one of those insane steam sales. Basically if it is a game that I have been wanting and it drops at or below $5 then it is pretty much an instant buy for me. I know sooner or later I will get around to playing it, and especially now with this new Sunday feature. The premises is deceptively simple… Metroid-Vania with Mining. In the game you play a robot miner who is coming to Tumbltown to follow in the footsteps of his uncle. The uncle had the claim on the mine directly below the town, and as such your are exploring the mine looking for resources and upgrades. The game employs an inventory system that looked deceptively like Minecraft, but in reality at least to the point at which I have played, you can only remove blocks, you cannot ever replace them other than with ladders that can be purchased for 5 coins each. The result is that initially you can only store quantities of three different ores at the same time. This quickly becomes an issue as before getting very deep you are regularly getting half a dozen different ores. This involves a lot of running back and forth to the surface to sell your wares in the little town. Each time you sell you are working towards an upgrade threshold cap. Each time you earn a certain amount of money you unlock additional new upgrades. The upgrades are then purchased with the coins you are earning from selling ore. 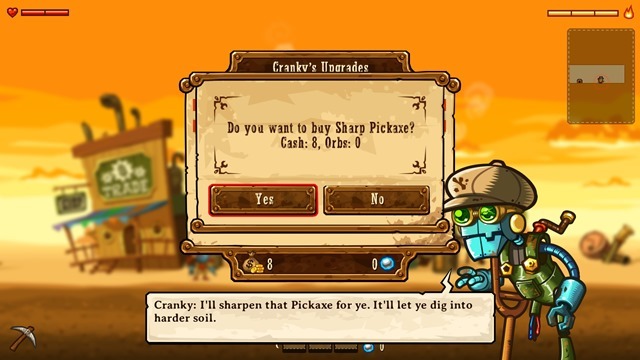 Initially you have access to the trading post and Cranky’s upgrade store, but I am assuming much like Bastion that over time other places may open for business. The first upgrade you can get is to your pick axe which similar to upgrades in Minecraft allows you to mine existing ore types faster, and the ability to break new ore blocks that you previously could not. Similarly in the second tier of upgrades you can add an additional bag slot allowing you to carry up to four types of ore at a time. This of course means fewer trips back up to the surface, and more time down below mining. 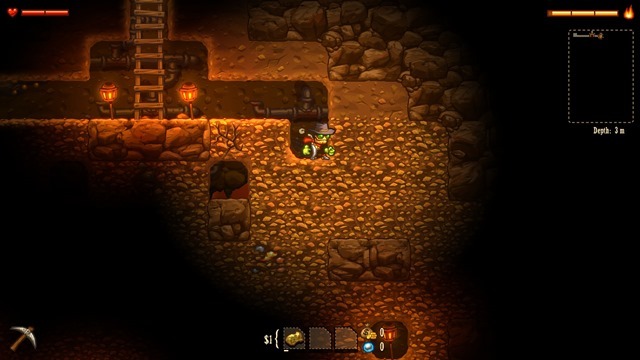 As you explore, you will uncover caves that shoot off of the main dig. These usually hide power ups and unlock new functionality. For example the waygate above gave me the ability to equip run boots, which means while pressing down X on my 360 controller I can run, and in the style of Super Mario World, jumping while running increases the range and height of the jumps. Additionally there are blocks that disintegrate as you walk over them, so in many of these puzzle caves the only way to get through is to run quickly over top of them. All of this progression will seem extremely familiar to anyone who has played a Metroid of Castlevania game. unlock tools so you can get to new places and unlock more tools. The game play gets progressively more and more difficult which adds an interesting spin on the Metroidvania genre. Since you cannot replace rock, you are essentially making your own playfield at all times by the choices you make as to what to dig and where to dig it. This means you can make life hell as you remove the wrong block at the wrong time. The game play is more about what you choose to leave standing and less about digging down to a specific objective. Above you can see my first death as I managed to get squashed by a rock that until this point I did not realize would fall down when I mined under it. This is also a decent time to highlight the lamp bar on the upper right corner of the screen. As you dig down your lamp light decreases at a steady rate. There are various fossils that will wake up when you get close to them and spawn worms. Killing these will drop an item that does two things. Firstly it will refill one bar of your health, and secondly it will add oil to your lamp meter letting you stay down longer. The only problem is it becomes pretty easy to dig deeper than you can possibly return from on a single lamp charge. There really seems to be no penalty for going without lamp other than the fact that you cannot see what you are doing. 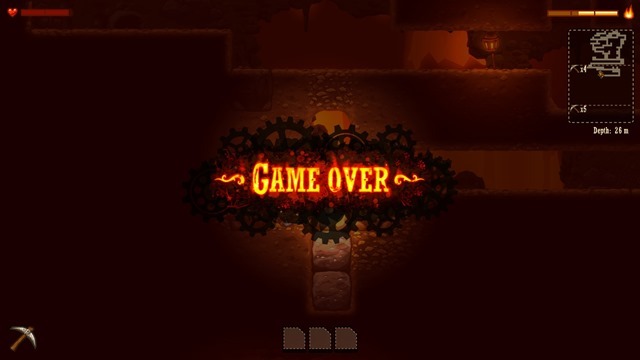 This means that you cannot identify what type of block you are mining your way into… which is suicide since there are the boulders that can crush you placed throughout the levels at an ever increasing pace. The game play is extremely fun and I found myself spending an hour or so playing the game before reaching a point at which I thought I could realistically write up this blog post. The only thing lacking with the game seems to be a point. I don’t necessarily mean that in a bad way, but both Metroid and Castlevania and the modern equivalent Guacamelee all have a narrative that drives the pace of the story ahead. 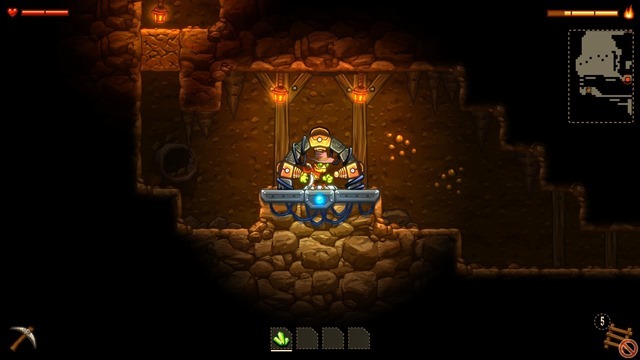 SteamWorld Dig on the other hand has a series of small objectives, but I am not sure if I am really building towards anything meaningful. I am digging so that I can get stuff that will let me dig faster. I don’t really care about the cast of robots that inhabit Tumbletown… yet. Over time this might change, but at an hour into the game I really am not feeling like there is some great purpose behind what I am doing. That is to say, the game is completely enjoyable without this deeper meaning. The game play is fun, the controls are responsible and it has as good of a wall jump implementation as I have seen. The problem is it just feels like there should be something more. I mean I realize you wander into the town and find your dead uncle, but this doesn’t seem to cause much intrigue or story to happen. Hell at this point I would even take a pokemon-esc “I want to be the very best” dialogue sequence to explain why I care about mining. I realize these are robots, but even robots should have a reason why they are doing things. Would I purchase the game again after having played it? Honestly yeah I would suggest folks picking it up, but only doing so at a deep discount. The game play is fun enough and it seems like a glorious time waster. It is the type of game you can just zone out and enjoy the mechanics of. The animations are cute and the sound design is really nice in places. I just keep hoping that eventually I will uncover something even vaguely resembling a plot.